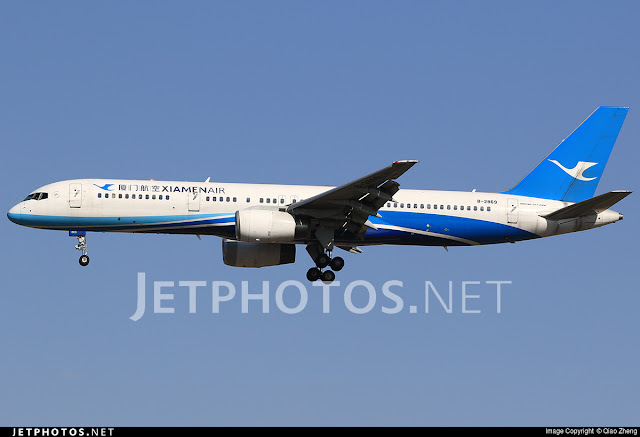 Welcome to my trip report on Xiamen Airlines Part 3! The scheduled aircraft was supposed to be Boeing 757-200, but the aircraft scheduled on that day was changed to Boeing 787-8 Dreamliner. In normal circumstances, I would be happy but because the Boeing 757 is a difficult aircraft to catch in Asia, I had mixed feelings about this one. I could have paid around S$100 plus to change the ticket, but after thinking it through, I decided to stick to my original flight and try this again perhaps in the U.S. This is the airline's Boeing 787-8 Dreamliner, you can check out my previous report over here. I woke up at 9 in the morning, feeling fresh from a good rest, I checked out and made my way to terminal 2 via shuttle bus. This time the wait wasn't long and I got a seat on the bus. Terminal 2 isn't as modern as terminal 3 but at least its pleasant to hang out at. I did my check-in at the counter and enquired about the aircraft type on my flight (hoping for a last minute change to 757), and she told me I could change it to the earlier flight (757 scheduled) but have to pay U.S$80 for the change, I decided to save the cash and asked her to proceed with the check-in and get me a window seat. Checking my flight, it was departing as scheduled. There are many check-in counters for Xiamen Air and China Southern, so you don't have to worry about long queue. Got my boarding pass and seat 43L was what I was given, hopefully not windowless seat! Once I got my boarding pass, I made my way to the floor above the departure hall to grab a bite at one of the restaurants. Looking at the monitor screen, MF8128 that day was operated by Boeing 757. Since I had time, I decided to have a little walk around the departure hall (air side). The layout of the domestic terminal 2 of Beijing Airport. It is actually quite big. Somehow this reminds me of Osaka Airport. My flight was to be departing from gate 24 and the signboard also display the distance from this location to the gate. For my flight, it was 50 metres of walking. Taking a look at the other side of the building. The walk from here takes around 15-20 minutes so make sure plan ahead if you decide to spend some time shopping or eating at one of the cafes. There are small coffee outlets around the terminal. There were quite a number of flights departing around that time, so it was quite busy. There are at least 7 coffee cafes at this terminal! Feeling hungry, you can drop by one of these restaurants. I find it to be quite a passenger-friendly airport especially for foreigners. There are English and Mandarin languages on the signboard, Free WiFi and a good number of eating places at this terminal, and the bonus for aviation enthusiasts is that the windows are photography-friendly and you can get some nice tarmac action especially during peak hours. For non-speaking Mandarin foreigners, most of the staff are able to speak English, so don't worry about language issue. Boarding took place early and this time the flight was more packed than my previous 787 flight. Fortunately for me, the middle seat between the aisle seat and my seat remained vacant. This set of crew were cordial towards the passengers. It seemed like they are happier working on the 787 Dreamliner than on the Boeing 737. Got a nice welcome from them and walked towards my seat with greetings from the crew standing along the aisle. That's a good start to the flight. I tried the seat for a while, and like my previous comment on this, it feels more of a business class product than first class. The private cabin of the business class. I tried this product before, its not bad. After arrival, I went over to the business and first class to check out the seats. The crew were absolutely fine with it. You are not allowed to store your personal belonging at the ottoman. This blue colour seat matches the airline's corporate colours. You get the engine view! I don't see the need of paying more for First Class product, this Business Class product looks comfortable especially flying it on long haul. Electronic dimmed windows - the talking point is the crew tend to lock it when cruising during day flight and not many frequent flyers appreciate it. What do you think? Once again the 'Welcome Speech' keeps replaying. Passengers on my flight enjoyed the Boeing 787 flight. I overheard conversations from some of them praising this aircraft. The cabin with the windows at its 2nd dimmest mode. At this point of time, the windows were controlled by the crew. Unlike my Hong Kong Airlines experience, my flight departed early and arrived more than 30 minutes early at the arrival airport, that's the power of the Boeing 787 Dreamliner. The in-flight service was good with frequent updates about our flight progress from the Captain and the passengers on board were well behaved, it was an enjoyable flight! Compare this to my previous 787 flight, its a tough call. I guess its the previous as I had the whole row to myself. This is what the blue box contains! I was surprised to see a banana. I got to say the airline is quite generous with the in-flight meal. This is quite a lot for one passenger. After the meal, a packet of peanuts and a choice of hot drink was served, I had the coffee. By the time I ate finish, I was full. This has to be one of the most generous servings among the flights I have flown so far. Here are the window-shot photos and video of the take-off. This is my window view, not very ideal. Once the aircraft pushed back, I spotted this China Southern's Boeing 737-800. The engines of the GEnX were started and we were soon on our way to the runway 36L. It was a pretty quiet period at that time. This Boeing 747-400F caught my attention! As there was no other traffic, we took off almost immediately. A smooth and gentle take off ! Along the way, I spotted Air China's special livery Boeing 777-300ER, did you see it? The impressive GEnX engines is definitely quieter than the GE90-110/-115B engines. Making a few turns and we were soon on our way to Xiamen. The light got a bit too bright for us (sitting on the right side). It was not long after, the electronic dimmed window was activated. The flight passed by quickly and soon we started our descend. There were a bit of bumps while descending but nothing bad. We were lined up for the single runway at Xiamen Airport. The sight of the city appeared and it was quite hazy. Since it was hazy, I decided not to take the video of the landing. Shandong Airlines Boeing 737-800 waited for us to land before it departed. The reverse thrust was deployed to slow the aircraft down. The sight of Xiamen Air's Boeing 757-200! Part of me wished I was on that aircraft. This concludes my Boeing 787-8 Dreamliner ride with Xiamen Air! It has been fun flying on this airline's aircraft. Time flies when you are having fun! It was a day more to go before my flight back to Singapore on the airline's 737-800. Xiamen Air has gotten itself a very competitive aircraft against its fiercest rivals such as Air China and I have been quite impressed with the design of the interior of the 787 and the uniform of the cabin crew. 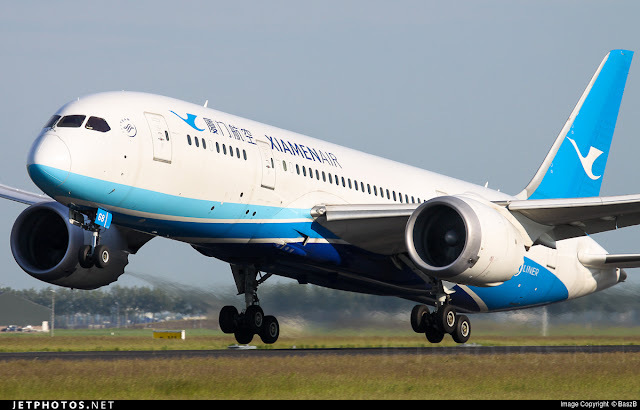 This airline means business as it looks to expand its international network and continues to dominate part of the domestic market especially at Fuzhou and Xiamen Hubs. I find the crew on the Boeing 787 generally better than the ones on the 737, including the XMN-SIN sector which would be my last part of Xiamen Air's trip reports. The IFE system and the In-flight meal are quite decent too, so my impression up till this point is quite positive. I will post an overview of this airline in my next trip report. For those who are considering flying on this airline's 787 Dreamliner on the long haul, I recommend it. 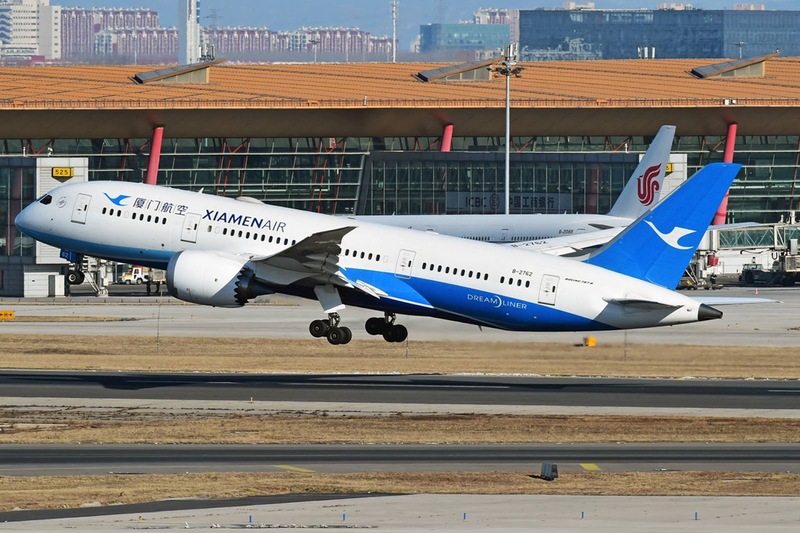 I would like to give many thanks to Xiamenir Carrier China for such extremely pleasing services to air passenger those want to fly around Asian countries at the lowest possible flight fare online. Its service was truly brilliant, electrifying infotainment, classic cabin crew member for attention to details to help your grab attention in your short or long hour journey on board. According to recent Asian aviation survey Xiamen air travel also reaching great figure in dealing with air passenger especially foreigner who want to experience ancient beauty of century old Chinese art, sublime nature, culture etc. Dreaming to fly and want to visit China then book your air ticket with Xiamenair China airlines flights online.